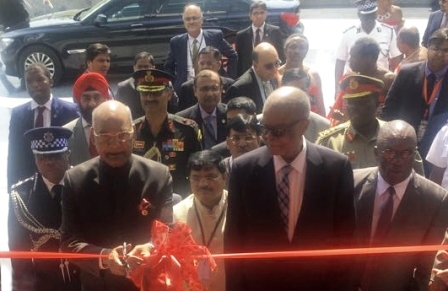 New Delhi April 10, 2018: The President of India Shri Ramnath Kovind and The Prime Minister of Swaziland, Shri Barnabas Sibusiso Dlamini unveiled Royal Science and Technology Innovation Park in Phocweni, Swaziland, on 10th April 2018. The park has been constructed by a leading Indian EPC Company Angelique International Limited (AIL), this facility, although operational will formally be dedicated to the people of Swaziland by His Majesty King Mswati III later. The US$ 20 million (INR 130 crore) IT Park has been financed by the Government of India under bilateral cooperation, and will contribute positively to attain Swazi Government’s Sustainable Development Goals (SDGs) through use of Information Technology. The construction was divided into various phases, including construction of office facilities and e-government facilities, as also, transfer of skills. It is Angelique’s extreme competence and professionalism that they delivered the project to the best satisfaction of the Swazi government. Mr. Rakesh Kumar Ahuja, Executive Vice President of Angelique said, “The newly constructed park comprises of education center – named Advanced School of IT (ASIT) which is running five course under franchisee agreement with one of renowned IT education provider (APTECH). Students have already completed 1st semester. National Contact center (NCC-call center) with working space of 204 calling agents with in-built training center. NCC already has MOU with Swazi Post & Telecom, Swazi Bank, FNB Bank, Swazi Election Commission. Incubation center to convert ideas to entrepreneur on the concept of Start up system like we have in India is also operational with 7 incubates and has capacity of almost 100. Common facilities like conference rooms, Video Conferencing room, meeting rooms, cafeteria, gymnasium, recreation center make it a place to work for. It also house a state-of-the-art data center with 66 smart racks called National Data center (NDC) to become hub for hosting data of all Government functions and also to become gateway of all online functions. Migration process to new data center has already started. “Since scientific advances and technological changes are important drivers of economic performance of any country, the ability to create, distribute and exploit knowledge has become a major source of competitive advantage, wealth creation and improvements in the quality of life that will amplify due to the IT sector shifting to more knowledge-intensive industries and services; and rising skill levels.” added Mr. Ahuja. SRMIST, Vadapalani campus organized REACT’19! !